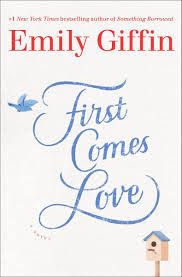 I have always enjoyed Emily Giffin's books for their relationship drama and the way she really drives to the core of people. Her characters often do things that are sort of outrageous and awful but she manages to write them convincingly so we understand the whys of how they got there. First Comes Love was no exception. Josie and Meredith were never exactly close sisters but the death of their brother during their young adult years sent them both off on different paths to deal with their grief. Meredith became a successful lawyer, wife, and mother, while Josie floundered in her relationships and became a first grade teacher. Both women are facing crisis of decisions in their life and they begin to realize many of their problems can be traced back to the loss of their brother. As someone with one sister and brother this was a bit uncomfortable. I get along well with my sister, though, we don't really see each other enough to ever waste time fighting. I found Josie to be relatable especially and her flaws were the sort I could understand. However, I struggled with Meredith. I am not sure if it was a case of just really not getting her or if Giffin failed to make her sympathetic at all. I feel like I should be able to understand and relate to ONE HUNDRED percent the kind of character that does things because she feels a heavy expectation from others and who lives out scenarios because they seem good on paper while not actually being great in real life. But Meredith was so difficult to relate to! I feel she was successfully written though, because there is a scene where her daughter draws her all frowny faced that is supposed to sort of give us a glimpse of how she is. Sad. Miserable. And that carried through in every one of her sections, I was miserable during them, lol. I hope that doesn't make it sound like I didn't like the book because I did. Very much. I love how blisteringly honest Giffin gets with her characters and the epic fight scene between the sisters was so raw and real. So! Two main characters alternating points of view, very different sisters, facing different life situations. And the title is perfect! I received a galley from the publisher!